I started the day with a little breakfast..the sheep is from the Aran Isles, and contributed the place mat...some soda bread, fresh strawberries, bacon and egg...not baaaa...d! You've met Spud, he is dressed in his green finery.. Some of you may remember Spud.... had to go to rehab....after this unfortunate incident.. 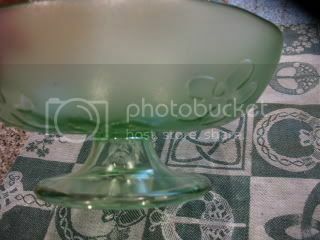 I use this green footed compote from Villeroy and Boch for my centerpiece.. 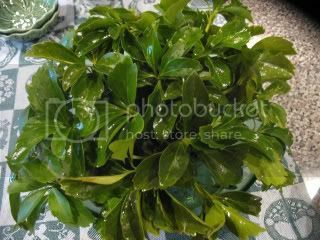 Put oasis in the bowl, and fill with greens...here the only thing green is pachysandra , so that will be it..
Take your fresh flowers, I used mums and baby's breath, and fill in the bowl.. The table is set....actually, a few.. 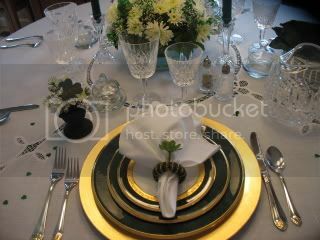 The dark green is Noritake, Fitzgerald..It is a very deep green with gold.. The white and gold .. is Noritake too. The glasses and pitcher are Waterford, Lismore.. The name place markers are little black urns...I got them after Cmas in Pier One, pulled out the little arrangement that was in it, put in oasis and fresh flowers and wrote the name on a shamrock..this one says Seamus, my grandfather's name and my 3 yo grandson's too! 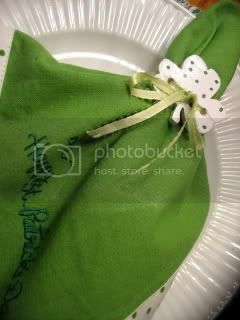 This was for a casual dinner last night...I made the napkin rings from wood shamrocks, painted them and then added dots..
Save room for the soda bread and oatmeal bread along with the corned beef, potatoes and cabbage.. 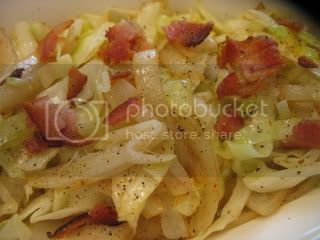 I make the cabbage differently..
Fry a few slices of bacon in a pan till crisp. 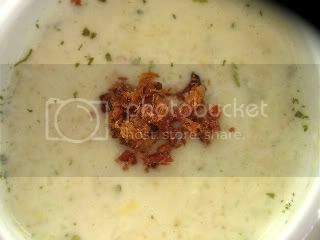 Remove the bacon and some of the drippings. 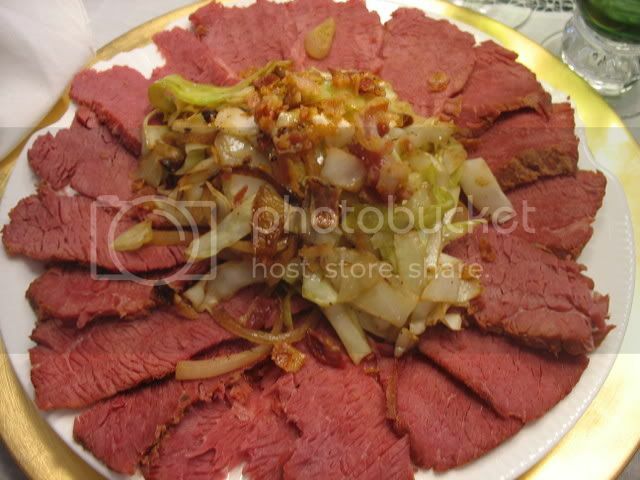 Place thinly sliced cabbage, sliced onions, salt, pepper and a few dashes of powdered mustard in the pan and saute. 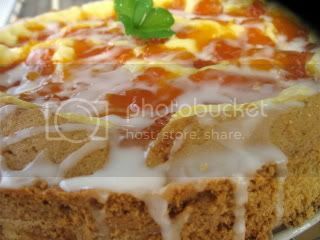 For dessert some St." Patricot" Cream Cake, I'll post the recipe tomorrow if anyone wants it...It's an apricot cream coffee cake.. 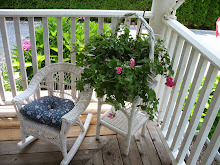 Please be sure to visit Susan at Between naps on the Porch Blog to see all the other tables.. 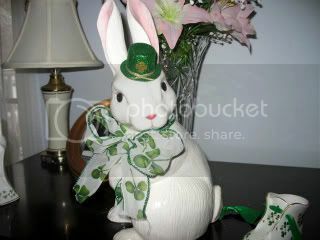 I missed the info on the party..will see if I can come up with something for tomorrow...Happy St Patrick's Day! You really overdid it.wowow.Am I impressed.Gollum told me to come as I was last Friday,I thought.eek!I feel kinda lazy now. 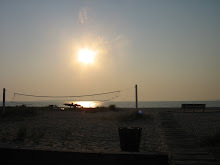 Kathleen – You surpassed everything I imagined you would have! 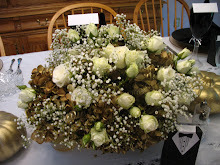 Your tablescapes were stunning, The dark green Noritake and the white and gold were my favorites! Also the Shamrock Meatloaf!! My darlin Irish Lass you are a magnificent hostess for this event.. my eyes started watering up with ‘Danny Boy’. THANK YOU !!!! 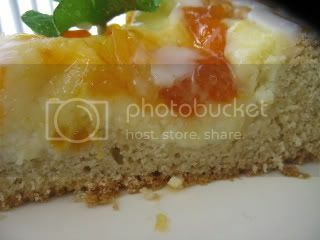 Hi Kathleen...if you only knew how hungry I am at this very moment...yummy! 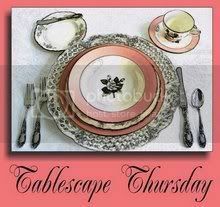 Your tablescapes are so very nice, but the menu is so delicious looking! Thanks for hosting this St. Pat's Day Party.. Looking good! You really out did yourself. I love your dishes..Fitzgerald. Well I love all of them. You have so many neat accessories and so many great ideas. I have some little urns I bought at the dollar store I need to make into a little arrangement. You have given me inspiration to do that! Your St. Patricot Cream cake is pure genius! And it looks delicious. Kathleen, I'll be coming to ye party, now, lassie! 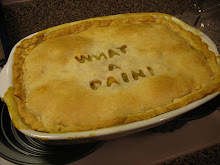 Ye know I don't know a bloomin' thing about cookin', but ay, I do know a thing or two about eatin'! And I love a good party. 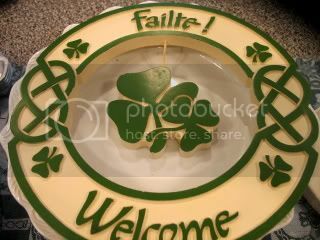 Gettin' my offerings ready for St. Paddy's Day! 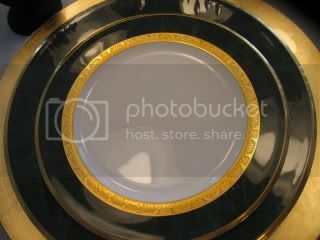 I just love your black, white and gold dishes and matching napking ring. I remember that sassy little drunken bunny's accident from last year - LOL. Wow Kathleen! What a fabuolous St. Patrick's Day post. The settings and the decorations are so much fun. All your food looks so darn good. 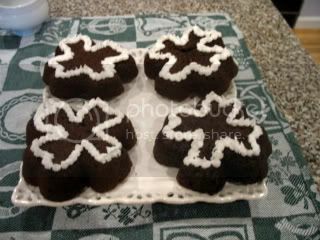 I love the clover shapes...what fun. Enjoy your St. Patrick's Day tomorrow!! 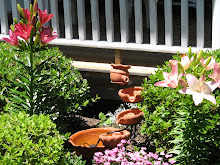 Kathleen, what a wonderful and FUN post! 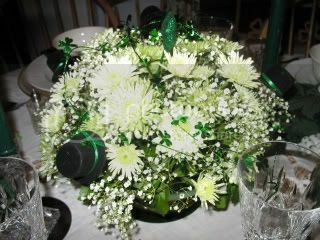 You really did it up big time...all those beautiful Irish things you have have definitely set the mood for the party! 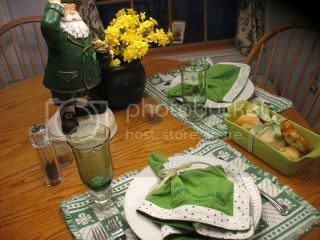 I love the tablesettings & the shamrock meatloaf :) You really make nice floral arrangements too, I keep meaning to tell you that. I loved it all but haven't had time to think about my offering to the party yet. I will post something tomorrow afternoon though. Kathleen, super, super post! You have so many wonderful St. Pat's things. Each picture is a celebration. This is a fun party... thank you for hosting! You did a fabulous job! I was telling my husband tonight that St. Pat's is my all time favorite celebration. Your party is absolutely fabulous! I love the food and can't wait to try the recipes...but all of the pictures were wonderful and heartwarming. Thanks for hosting a GREAT St. Paddy's Day event! Top o'the mornin' to you ! Very Kathleen very St-Patrick's Day! This post has your signature everywhere. Everything looks delicious - and poor bunny, I hope he's doing well after his trip to rehab (too funny!!). I'm sorry that I didn't realize that you were having a party! I would have invited myself. 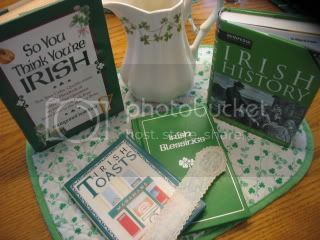 I love all things Irish, that includes my Mom. I was married on the 20th 33 years ago. 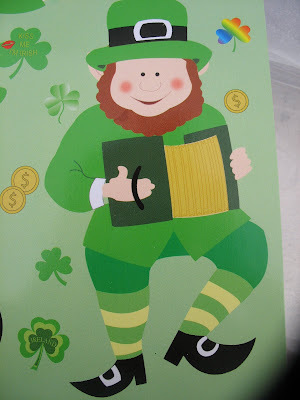 It would have been on St. Patrick's day but it was in the middle of the week:( Today I'll be making Irish soda bread, watching parades and the shopping cannel to get some Irish goodies! 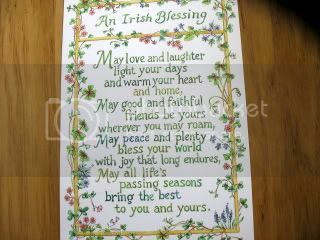 So many special touches from the shamrock on the egg and the darling sheep, to the Irish blessing. 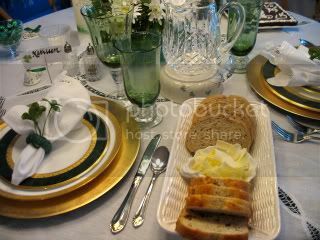 Gorgeous table settings and fabulous food.... something for everyone ...What a hostess. 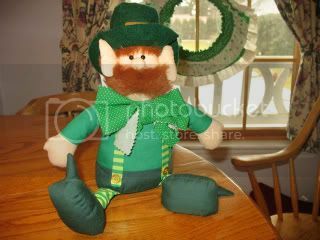 I remember seeing a close up of the Lefton Irish angel. What a sweet face. 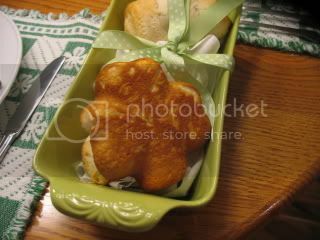 And it wouldn't be St. Patrick's at your house without the naughty Spud. The sharmrock-shaped meatloaf is completely over the top. Kathleen, you do the Irish proud! PS: I gave up beer for Lent again this year...I'm gonna have to rethink that Lenten sacrifice for next year! You really know how to celebrate!!! 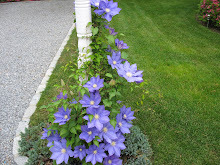 Loved your post. Especially the bunny rehab, too funny. 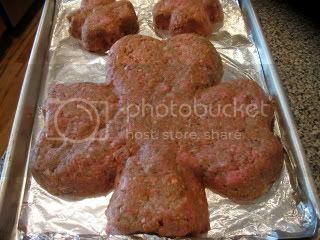 I loved the clover shaped meatloaf, may just have to make it for dinner since I don't like corn beef and cabbage. But I do love meatloaf. Thanks for sharing. I loved it all!!! Are you pooped from the all day party yet? I just got my second wind and am trudging on. 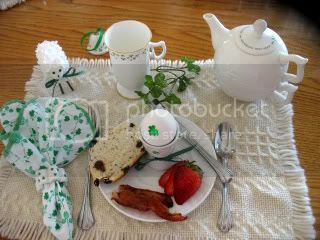 Love all your St. Patrick's Day decorations and the food looks so delicious! 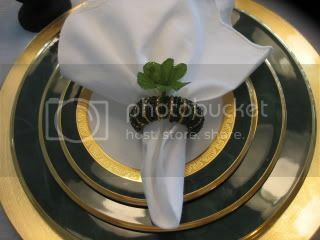 The dark green Noritake used with the white and gold plate looks so elegant. 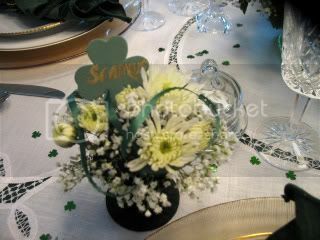 The shamrock napkin holders are really cute...a clever idea! Oh, For Fork's Sake! That is some spread, Kathleen...a real lace curtain Irish affair;)...we won't speak of Spud...and where are dee lace curtains? Cheers and Happy St. Patrick's Day. Kathleen, I know where to eat next St. Patrick's Day! You went over the top, but that doesn't surprise me at all. 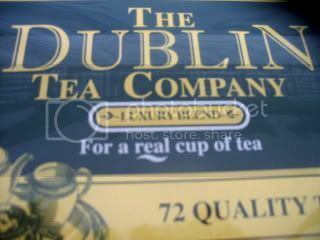 You are a true Irish lass, who enjoys a good celebration. 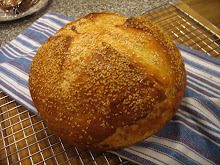 And thank you for the Irish soda bread recipe. 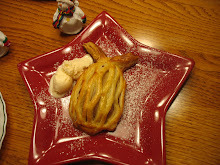 We really enjoyed it, and it will be on our menu next St. Patty's day. I don't think you could go to any place and have a dinner lay out like this. The food looks awesome. Your table is the perfect tablescape sitting. Must have been some party! Even for the rabbit. I always enjoy a "visit" with you. Your recipes look heavenly. You always come up with the most creative tables. WOW, I don't know where to start what a wonderful post, Hope you had a wonderful St Patrick's day, this was fun, creative, beautiful and delicious all at once. Happy Thursday, Kathy. Very Impressive, everything looks so GREAT!!! Poor spud...maybe he won't overdue it so much next year! I was on the floor with that! Oh my, what a grand Irish table! How beautiful! Great choice to share today! 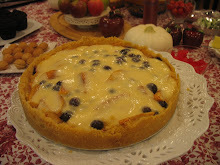 And all the food is so yummy looking! I love the colors! 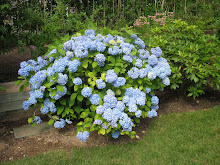 Happy Thursday to you! Now that's an impressive Irish meal. Your cabbage recipe is very interesting. I have copied it down to try at home. Thanks for sharing. 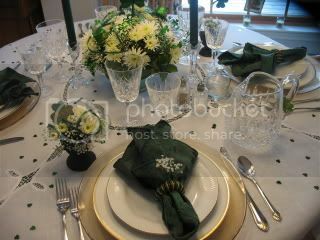 I am glad I did not see your amazing Saint Patrick’s Day extravaganza, before I posted my first Tablescape Thursday. I will quietly walk away now in awe, with recipes in hand, yum! WOW! what a feast for the tummie and the eyes! Mmmmmmm! Wow, I love it all! Please do post the coffee cake recipe. 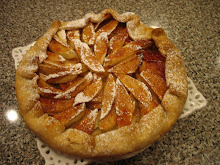 My mom loves all things apricot and I would like to make it for her sometime. Spud's little "mishap" is so cute! I'm so laughting at your bad boy bunny! Love all the St. Patrick's eating through the day! You had it going on! Oh my goodness. Did you have to go to bed to recuperate after all of that? It was just over the top! Of course, I have to admit...I was still laughing so hard about the "accident", I don't remember much else! You are too funny! Sorry I missed the party...Are there any 'leftovers' ? Another spectacular menu, and a lovely table to enjoy it all. Gorgeous table, fab food -- including that hilarious shamrock shaped meatloaf! 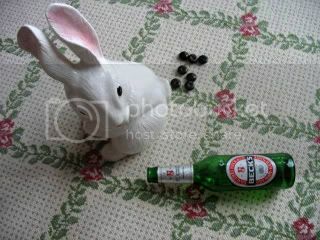 -- and SPUD the Wonder Bunny with the little drinking problem. So he was a bit of a challenge to house-train, eh? 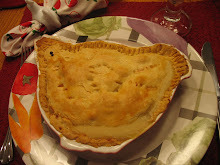 Love your tables -- and the food -- and there is nothing like Waterford! 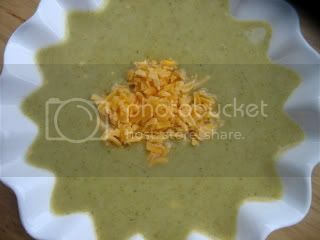 I am back for some soup...any left over? I'll take either one! I'm a little late...but you put an awesome tablescape together...and the food, my goodness, you are awesome. Now Spud is cracking me up...with the "unfortunate incident," that is soooo funny! Love this. Oh my goodness! You did not miss a thing! 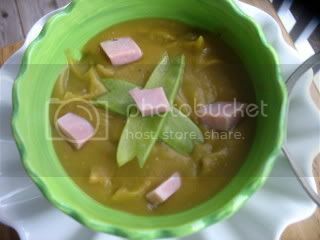 I am a little late making the rounds this week but your tables and St. Patty's day dinner is out of this world! 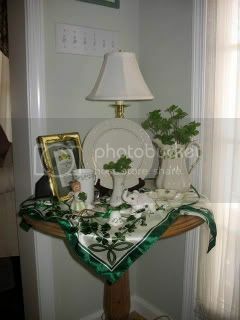 I enjoyed every single picture and all the little spring touches with St. Patty's day flair! I can not believe you shaped that meatloaf into a shamrock! Incredible talent, that's what you have! Awesome. Everything is just wonderful here. The food, flowers and all stuff.... Can I have all of them?